Prior to teaching, Veronica served in various roles including We Are Unlimited (DDB Worldwide Inc.), FCB Chicago, Northwestern University Kellogg School of Management, Feinberg School of Medicine, and Purdue University. As an educator at DePaul, Veronica has also served as a Board Member on the Committee for Contingent Faculty. 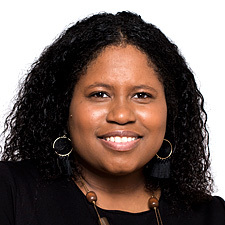 She completed her undergraduate education at Purdue University, graduate education at DePaul University and currently pursuing a doctoral degree in organizational leadership at The Chicago School of Professional Psychology. Veronica has been featured in Crain’s Chicago 20 in their 20s, Diversity Journal’s Top Professionals in Higher Education, received the Relationship Advocate Award from Chicago’s Perspective Charter Schools, received the Champion of Growth Award from Coalesce Chicago, named the 2017 Chicago Scholars 35 Under 35 Honoree, and received the 2017 DiversityMBA Magazine’s Top 100 under 50 Emerging Leaders Award.